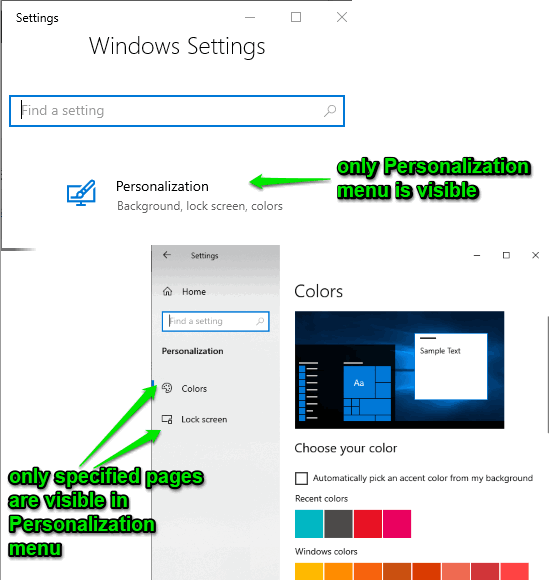 This article covers how to show only specific pages of Settings in Windows 10. Settings window contains Network & Internet, Personalization, Accounts, Cortana, Update & Security, Phone, Devices, Apps, Gaming, and other menus. Each menu has different and important pages like Display, Multitasking, Clipboard, Wi-Fi, Mobile Hotspot, Data usage, Background, Lock screen, Fonts, Themes, Taskbar, Sign-in options, Game bar, and lots more. Using these pages, you can avail or turn off a lot of features of Windows 10 as per your requirements. For example, you can enable Clipboard history, check and limit data usage, uninstall apps, show/hide most used apps in Start menu, enable game clips recording and screenshots using Game bar, and do many other things. Those who are satisfied to have all the pages in the Settings window, they don’t need to do anything. However, others, who want to see the specific number of pages only, which they access frequently, and want to hide the rest of the pages, this article is gonna helpful. 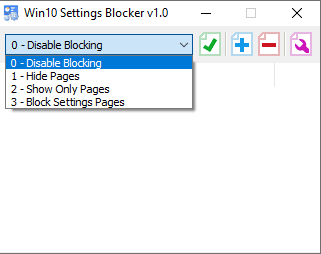 To show only specific pages of settings in Windows 10, I have covered a free and very simple software, known as “Win10 Settings Blocker“. 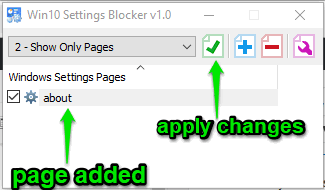 This software lets you select settings pages one after another and then apply the changes to view only those pages under Windows 10 Settings. Menus related to those pages are visible and rest of the menus and pages remain hidden. You can also bring back all the pages again and anytime. So, there won’t be any problem. Let’s take an example. In the screenshot above, you can see that earlier all the menus were visible and all pages were visible in Personalization menu. Now see the screenshot visible below. As you can see, I hid some pages from Personalization menu. 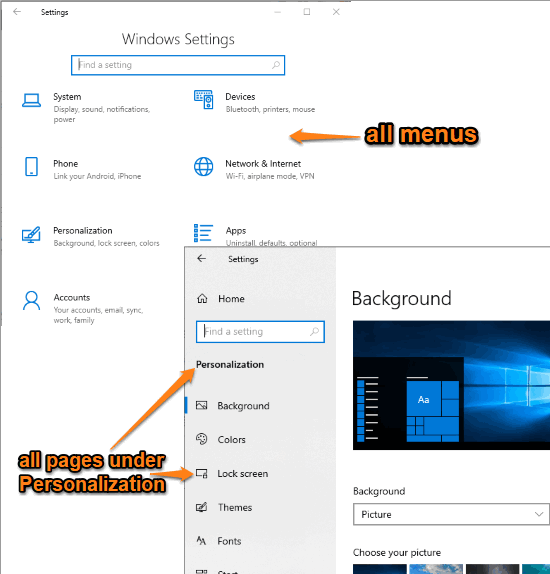 As a result, the main interface is showing only Personalization menu and only selected pages are visible under the Personalization menu. 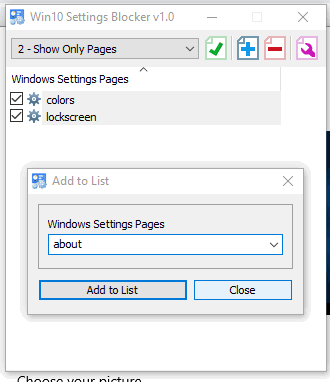 How To Show Only Specific Pages of Settings in Windows 10? Step 1: Download the zip file of this software, named as “WsBlocker” and then extract it. Execute the WsBlocker.exe file and its simple interface will be visible. Step 2: On its interface, use the drop-down menu and select “Show Only Pages” option. When that option is selected, tap on the ‘Add to list‘ button. Step 3: When you click on Add to list button, a small window appears. That window has a drop-down menu which contains the list of all the pages of Windows 10 settings. You need to select a page and use “Add to list” button. Here, one thing that I didn’t like is it doesn’t give any hint about which page is associated with what menu. So, you need to do that yourself. You can add more pages one by one and the name of all those pages will be visible on the main interface of this software. Now you can press the “green tick mark or checkmark” button to apply the changes. When you will open the Settings window (Windows logo key + I hotkey). You will notice that only selected pages and menu related to those pages are visible in Settings. Step 4: To undo the changes, simply select “Disable Blocking” option using the drop-down menu on the software interface and press the green tick mark button to save the changes. Earlier, I covered a similar article for this purpose (check it here). But, I did that using Registry Editor and Group Policy Editor of Windows 10. Those methods are also effective but this one is easier. Those who are not familiar with Registry Editor and GPO and need some simpler way to show only specific pages of settings in Windows 10, this software is a very good option to try.